Blackmail is another weapon Nigerians deploy to flaunt their innocence whenever they are at the threshold of being nailed on any issue. Most times, the manner Nigerians resort to blackmail stands logic on its head, twist morality and offend laws of the land. Although, several Justices in Nigeria are under investigation, but the case of the two embattled Supreme Court Justices John Iyang Okoro and Sylvester Ngwuta’s whom the DSS raided, arrested and detained for alleged judicial corruption has assumed an asinine twist. 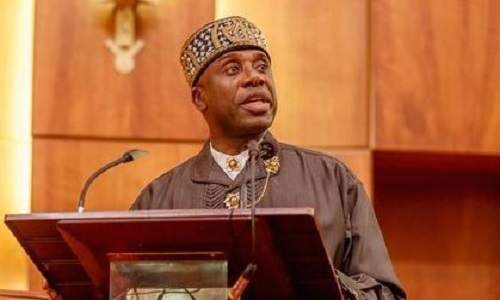 Conspiratorially, the duo rushed out in public domain to hear allegations of attempts to corrupt them by former Rivers State governor and Transport Minister, Rotimi Chibuike Amaechi. They mindlessly lashed out at Amaechi whom they accused of providing the grounds for their persecution for refusal to tinker with some governorship elections petitions before the apex court. They funnily want Nigerians to believe the refusal to be negatively influenced by one person forecloses the chances of accepting the same request from another person. Justice Okoro started it all. Precisely, on October 17, 2016, he claimed in a letter to the Chief Justice of Nigeria, (CJN) Justice Mahmud Mohammed that he rejected the offer of Amaechi to influence Justices to alter verdicts on the governorship tussle in favour of APC in Rivers, Akwa Ibom and Abia states. The Justice expressed strong conviction that his present travails may not be unconnected with his snubbing of Amaechi’s request to tamper with the verdicts. And that he made a verbal report to the CJN on February 1, 2016, about Amaechi’s visit to his official residence. “In that report, I told you, my Lord that Mr. Amaechi said the President of Nigeria and the All Progressives Congress mandated him to inform me that they must win their election appeals in Rivers State, Akwa Ibom and Abia states at all costs,” he enthused. Less than 48 hours after Justice Okoro’s publicized allegations on Amaechi, another embattled colleague also under the heat of DSS over judicial corruption mouthed the same allegation. What separated the two were the states involved- only Rivers and Ekiti states guber disputes. Justice Ngwuta’s allegations were contained in a letter dated October 18, 2016, also addressed to the CJN. Lamenting his several unfriendly encounters with Amaechi, the Justice reeled out series of mind-boggling issues, including alleged threats he received from Amaechi. Interestingly, whatever problem the accused Justices have with the DSS is strictly their burden to resolve. But the hasty roping of Amaechi into their dilemma with the DSS based on such hazy recollections and projection of the abnormal belittles their status as Justices of the apex court. By the submissions, it is quite discernible the judges have advertised issues intended to raise a podium to rubbish and blackmail Amaechi; except that they are poorly scripted in timing and factuality. First, from the files of the DSS and the EFCC, at least 15 judges at various layers of the Judiciary are under investigation currently for alleged judicial corruption. The submission of Justices Okoro and Ngwuta in the letter to the CJN is forcing a baseless impression that the remaining 13 judges too could have possibly turned down Amaechi’s overtures to influence verdicts in their courts and thus, his invocation of “harassment” from security agents? It cannot be true. And let’s hypothetically agree that President Buhari is an interested party in any of the governorships disputes in the mentioned states, under litigation at the Supreme Court, but everyone knows it’s impossible for him to delegate Amaechi to influence any judge at his behest. Ideally, he would rather parley with the CJN directly expressing his interest in the cases and it ends it all. But if he cannot condescend to the level of the CJN, the alternatives are clear and Amaechi is not in this reckoning by any stretch of imagination. To further water the impression of the DSS’s arrest and detention of the Justices as vendetta for their refusal to compromise justice, the wailing Justices speak as if the Director-General of the DSS or the Chairman of EFCC take directives from Amaechi, so with his snap of the fingers to settle a personal grievance, the security agents rushed after the accused Judges. But the Justices, especially those on the Bench of the Supreme Court are the final destination in the interpretation of Laws of Nigeria. Like the River State APC Chairman, Chief Davies Ibiamu Ikanya averred in a public statement, the Justices should know better that the giver and taker of bribes commit criminal offences under the Corrupt Practices And Other Related Offence Act 2000. These learned Justices had the opportunity to brighten Nigeria’s perception of Buhari’s anti-graft war by publicly clipping the wings of Amaechi who sought to adulterate their verdicts with bribes. But they reneged; waited for months to be accused of judicial corruption before they remembered their uprightness or vow not to desecrate their sacred oath of office. These are tales far from the truth. Additionally, a very senior Judge like Justice Ngwuta as disclosed in his distorted epistle to the CJN was threatened by a politician like Amaechi who came to his house and said ‘we shall see’ several times,” and he kept mum? It is conceivable that a Supreme Court Judge would bury obvious threats to his life and would not even document it with the National Judicial Council (NJC), but merely inform the CJN verbally. Is he saying the NJC forbids members of the Bench from taking legal actions against violators of their rights or when their lives are threatened? It brings the matter to the doorstep of another realm of reasoning. Almost all the raided, arrested and detained judges are alleging innocence and judicial persecution by the Presidency. They have also qualified the raids of their houses, arrest and detention as illegal and unconstitutional. It implies the DSS and its principals have infringed on their fundamental human rights as Nigerians. But they are unprepared to explain to Nigerians what is restraining them from challenging DSS action in court, if they are convinced of their innocence. Or are they implying that laws governing the NJC also forbid Judges from seeking legal redress over personal injuries or infringements on them by individuals, government institutions or the government itself? These Justices should go back to their factory of doubtful tales and bark out something more convincing to Nigerians. For now, their rehearsed fables with the glaring intent of blackmailing Amaechi nay the FGN to inspire public sympathy has failed to impress anyone and hit the rocks. Guest columnist and public affairs commentator.